The NewsLine: US campus pepper spray outcry. A US university says it is launching an investigation into the use of pepper spray by riot police trying to clear a demonstration. Video of the incident at the University of California, Davis, shows officers blasting seated protesters in the face with the chemical at close range. The university chancellor, who had called in the police, described the pepper spray incident as "chilling". The protest, on Friday, was in support of the Occupy Wall Street movement. It was intended to show solidarity with protesters at another branch of the University of California, in Berkeley, who were hit with batons by police on 9 November. The footage of the pepper spray incident, which has been circulated widely on the internet, has caused outrage among students. The protesters are seen sitting in a line on the floor with their arms interlocked, refusing to move. They try to cover their faces as officers in riot gear walk along emptying canisters of the spray onto them. Linda Katehi, Chancellor of the University of California, Davis, near Sacramento, says she is forming a task force to investigate what happened. "The use of pepper spray as shown on the video is chilling to us all and raises many questions about how best to handle situations like this," she said in a message on the university's website. The Davis Faculty Association, which represents academic staff, has condemned the University of California's approach to protests on several different campuses. "This week, we have seen excessive force used against non-violent protesters," said a statement on the association's website. "Student, faculty and staff protesters have been pepper-sprayed directly in the eyes and mouth, beaten and shoved by batons, dragged by the arms while handcuffed, and submitted to other forms of excessive force." "The violence was unprovoked, disproportional and excessive," it said. "We demand that the Chancellors of the University of California cease using police violence to repress non-violent political protests." The Association said Ms Katehi should resign, a call she rejected. "I do not think that I have violated the policies of the institution," she said. "I have worked personally very hard to make the campus a safe campus for all." 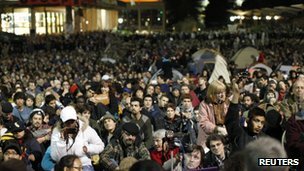 The Occupy Wall Street protest began in New York more than two months ago against perceived corporate greed and economic inequality. Similar protests have since sprung up in other places around the United States and elsewhere in the world.